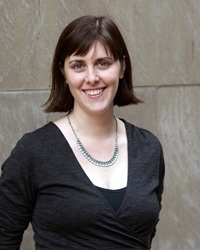 Meredith Mazzuca joined the CBF in October 2005. As Director of Marketing & Communications, Meredith is responsible for overseeing the CBF’s communications and online presence. In collaboration with the Executive Director and the Marketing Committee, Meredith develops and implements marketing and communications strategies for the CBF, including the production of publications, communications with CBF supporters, marketing support for CBF programs and events, the growth and maintenance of CBF’s online presence, and outreach to the media. Meredith graduated from Indiana University Maurer School of Law in 2004 and has completed additional coursework at the College of Law of England and Wales. She also holds a Bachelor of Arts in Psychology from the University of Kentucky. While a resident of Bloomington, Meredith interned at Student Legal Services and participated in the Volunteer Income Tax Assistance Program where she prepared returns and provided consultation to low-income and elderly residents. A native of Kentucky, Meredith has resided in Chicago since 2004. She lives in the Logan Square neighborhood with her husband and three children.